So there has been some discussions going on around the web regarding "digi stamps." Of course we at FCD have been discussing it too! There is a great article up over at Stampers Quest if you want to read more into "digi stamps." I myself am not really that into them and in fact have coined them "faux stamps" because it is FAKE stamps there really is no stamping to it it should be "digi print & color" or something LOL! But for the sake of argument and well because Pamela drew this awesome image and is forcing me to "faux" stamp I made this card. It is printed on vellum and colored with Copic markers - BIG NO NO! The marker tips pick up the ink so I actually ended up coloring it by dabbing the marker onto the vellum instead of circles and well it was simply a PITA and I might of ruined one of my marker tips as I can't get the printer ink scribbled off. You can have this image for your own Faux Stamp collection too if you'd like just click here to go to Pamela's blog and check out her card. In her post are the directions for downloading your own copy of this and leave her a comment too should she step into the "digi stamp" world? ILOVE the way the color turned out, even if it was a PITB...and your choice of papers is terrific! yeah you! Fantastic stamped on vellum- Love this card! 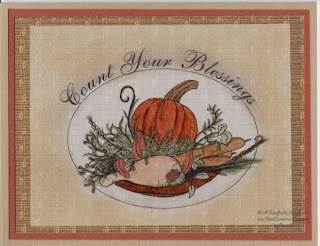 Glad you stepped out onto the 'dark' side and for sharing the wonderful Thanksgiving stamp you shared! Your card came out great. I saved this image, just trying to figure out how I want to do it. And not with copics either. I don't have enough. Thanks for the blog candy too. I can use all of it. Thanks so much!! I'm sorry that it ruined your copics, that is so sad! I'm not much for the digis either...I want RUBBER!! LOL!! Very nice card none the less! Just an idea - what if you color from the back of the vellum - it will be lighter, but won't ruin the markers. Just an idea. And I like Rubber - a digi is good in a pinch if I am waiting for my rubber to arrive, but I won't touch it again after the real thing gets here ... and how can you emboss with a digi - You can't. Winners and Happy Halloween to you all! It's the Best Time of the Year!